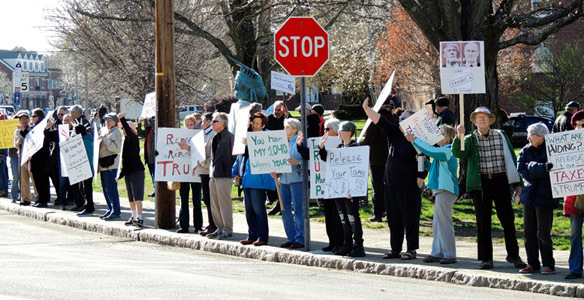 Members of Minuteman Indivisible, along with about 1500 people, lined up to hear Senator Elizabeth Warren at the town hall in Concord. Needless to say, members were not disappointed. 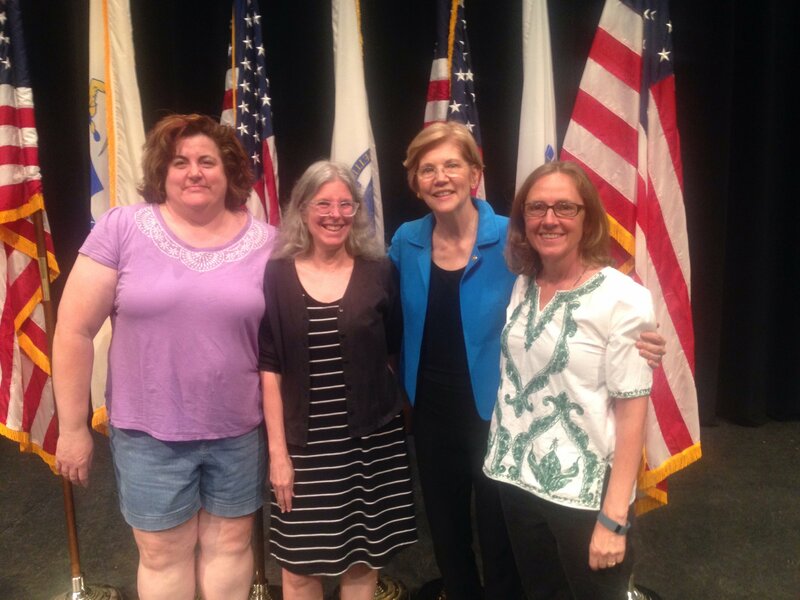 We got to hear first hand Senator Warren's views of the swamp followed up with some advice: join an organization, commit to do at least one thing everyday, and talk to people in other states that hold different opinions. We've been wanting those presidential taxes since January and here is our chance to voice that opinion loud and clear. Senate bill S.365 would require candidates for POTUS to disclose their tax returns in order to appear on a Massachusetts primary or general election ballot. It is time to make the release of tax returns a requirement versus a voluntary action. Please join members of MI as we head to the State House with other Indivisible groups to provide testimony on why this should be the law in MA. The hearing is set for September 6, 2017 at 1:00PM in room B-1. If you can't be present at the hearing, please submit written testimony. Here is a sample letter or you can draft your own; you can submit the letter directly to the members of the committee (which are on the top of the sample letter) or to democracy@minutemanindivisible.org and we will deliver it to the hearing. The Elections Team has positions to fill. As we've just picked our first five candidates to support in the 2018 house races (Kristen Rosen-Gonzales in FL27, Chrissy Houlahan in PA6, Regina Bateson in CA4, Carol Shea Porter in NH1 and Mikie Sherrell in NJ11), we need to staff up! Currently we are looking for someone to coordinate our efforts on the Mikie Sherrell campaign. Ms. Sherrell is coming to the area for a fundraiser in September (see the events calendar for details) and we need someone to help coordinate this and further efforts on behalf of her campaign. As we go forward we'll be looking for more campaign coordinators, and for help with phone banking, post carding, texting, social media, and research. Help us turn the House blue! A full description of activities can be found on the Elections Team page. Please email elections@minutemanindivisible.org to volunteer. Minuteman Indivisible is organized as a 527 PAC. We need to have a lawyer's expertise to help us read over the rules and make sure that we are interpreting them correctly. If you are willing to help with this task, please contact us at info@minutemanindivisible.org. The MI elections team is focusing on flipping the US House and has selected its first set of US Congressional candidates to support. One of these compelling candidates is Mikie Sherrell who is running in the NJ 11th district (North-western New Jersey). She is a Seth Moulton endorsed federal prosecutor and former navy pilot and is now running for Congress against Rodney Frelinghuysen. Mikie will be in the area on September 8th and 9th. Minuteman Indivisible is co-hosting a fundraising breakfast for her in Arlington the morning of September 9th. 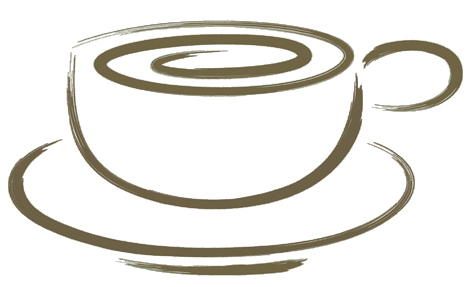 Join us for bagels and coffee and hear about her campaign and candidacy. If you are interesting in attending please RSVP with the elections team and we will send you all the event details. Come learn about a better health care system: Improved Medicare for All Panel Discussion with Senator Jamie Eldridge, Representative Jen Benson & the MASS-Care Coalition. Improved Medicare for All bills have been sponsored in MA by Senator Eldridge and Rep. Benson to create a cost-effective medical care system that covers all medically necessary privately delivered care for everyone, without premiums or co-pays or pre-existing condition exclusions, tax-funded and financially managed by a state agency. Event is free but requires registration. Join us at this new daytime group that will meet during school hours. If you are interested in being part of this group, please fill out this form with your preference for days, as well as mornings vs afternoons, so that we can start planning. Daughter and Mother Camp Congress for Girls Boston 2017 is a leadership program that introduces girls ages 8 to 15 and their moms (or dads) to politics. Register here. Come strategize for the congressional races the team selected to focus on at our August meeting! If you would like to volunteer for a district race or for a specific campaign action please fill out our Elections Form. Join us as we discuss Don't Think of an Elephant by George Lakoff. There’s no need to have read the book in advance. We’ll provide a brief summary to get the discussion started and focus on how it applies to our Minuteman Indivisible activities. Click here if you hope to join us or have a book that you would like to suggest as a candidate for a future meeting. Please join us for the next Healthcare meeting. Now that the House and Senate repeal and replace healthcare dramas are over, sabotage of the ACA has gone underground. We will be kicking off our healthcare advocacy efforts for the Fall and look forward to welcoming new members, or welcome back old members. At this meeting we will break into focus areas such as defending the ACA against sabotage, bi-partisan efforts to improve the ACA, single payer, or whatever other topics are of interest to the group. Did you know that Donald Trump has nominated Sam Clovis, his longtime campaign aide, to serve as the USDA Under Secretary for Research, Education, and Economics? As Under Secretary, Clovis would manage the USDA's $3 billion research and education portfolio and serve as the USDA's top scientist, coordinating the setup and implementation of the USDA's policies. The 2008 Farm Bill specified that nominees to the Under Secretary post should be "distinguished scientists with specialized training or significant experience in agricultural research, education, and economics." As one third of our greenhouse gas emissions come from agricultural production, it is also critical that the USDA's top scientist acknowledges that climate change is real, human-caused, and a dire threat to our global security and food supply. Clovis has no scientific education or background. He has called climate science "junk science" and declared himself a climate change "skeptic." As a talk radio host and blogger from 2011 to 2014, Clovis stoked racist birther conspiracy theories about then-President Obama, made derogatory racist comments about then-Attorney General Eric Holder, and stated homosexuality is a choice and can lead to pedophilia. In light of the white supremacy rallies in Virginia, the appointment of a racist, bigoted birther to a top job in the executive branch is unacceptable. Please call Senators Warren and Markey to register your opposition to the nomination and ask your friends in Republican represented states to do the same. The National Indivisible organization is creating lots of resources to help us stand up against white supremacy. They suggest starting with this toolkit. Then, learn about the march from Charlottesville to Washington DC #Cville2DC and watch this week's Facebook video from Indivisible and Color of Change. Finally, one of our very own members, who recently moved here from Charlottesville, let us know that her former synagogue in Charlottesville is in need of funding for increased security. They have setup a GoFundMe page to raise money for their security needs. If you are interested in donating, here is the GoFundMe Page. For more information, read this moving article. U.S. District Court Judge Daniels has issued an order setting oral arguments for Oct. 18 on a suit the liberal watchdog group Citizens for Responsibility and Ethics in Washington filed in January. Daniels took over the case last month after Judge Ronnie Abrams recused herself, apparently because her husband accepted a job as a prosecutor on the staff of Robert Mueller. Read this Politico article for more details.